up to 8 Doses / Day - World's First Adjustable Pillbox. 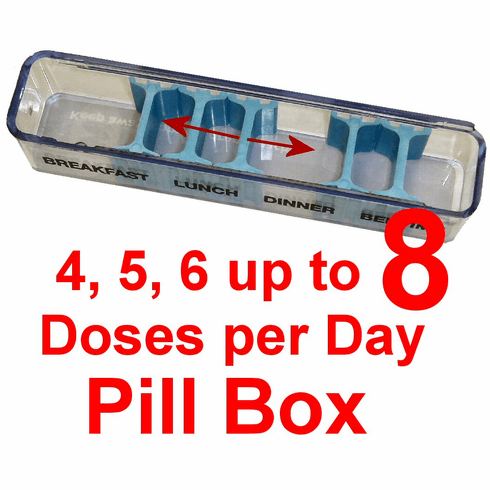 Up to Eight (8) of Dosages per Day pill box medicine organizer. We found the world's most flexible weekly pillbox organizer system in Denmark. The dividers slide and can be added or removed. 3 3/4 inch x 3/4 inch x 11/16 inch. Very popular with Parkinson's patients or any patient taking medications multiple. Up to Eight (8) of Dosages per Day. Adjustable Compartment Size (Large in the morning for example). Capacity: VERY SMALL Compartments. Hold ONLY 2 Aspirin sized tablet if used for 8 Times per Day. Each pillbox can be divided by inserting/moving the dividers. Great for Parkinson's patients, or any patient taking medications multiple times per day. Color: Pill boxes are made of Clear Plastic. Weekly Organizer is Blue Vinyl.